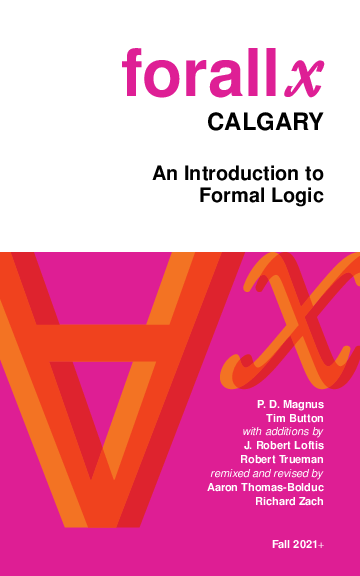 This is the formal logic textbook, forall x: Calgary Remix. It is based on forall x: Cambridge, by Tim Button used under a CC BY 4.0 license, which is based in turn on forall x, by P.D. Magnus used under a CC BY 4.0 license, and was remixed, revised, & expanded by Aaron Thomas-Bolduc & Richard Zach. It includes additional material from forall x by P.D. Magnus and Metatheory by Tim Button, both used under a CC BY 4.0 license, and from forall x: Lorain County Remix, by Cathal Woods and J. Robert Loftis, used with permission. The LaTeX source code for this work is available on GitHub at github.com/rzach/forallx-yyc. Note that these files change whenevery the source files are changed. So if you use the text in a course, better to download the PDFs and make them available to students directly, than to link here. You’ll have to run makeglossaries to produce the glossary as well. To make changes to the definitions in the preamble and forallyyc.sty file, put them in a file named forallxyyc-local.sty. For instance, to get the connectives to be & for and and horseshoe for the conditional, copy forallxyyc-local-sample.sty to that file.